As a vehicle owner it is necessary to provide your vehicle with factory scheduled auto maintenance to ensure that it continues be a reliable source of transportation. There are numerous types of maintenance that are required at different mileage intervals, the following being some of the most common forms necessary for just about any kind of of car, including import and domestic autos. Be sure to read the maintenance schedule inside of your owner's manual to find out when your car is due for certain services. Many maintenance procedures will fall under the 30/60/90K category, which is service needed every 30,000 miles. This may include safety inspections, engine diagnostics, fuel and air filter replacement and installing new spark plugs and spark plug wires. Most vehicles require oil changes every 3,000 to 5,000 miles in order to keep the engine properly lubricated. OIl changes also help to regulate the operating temperature of the motor, and the oil change process cleans out the motor of unwanted contaminants. Whether you drive a manual or automatic transmission vehicle it is going to need transmission service according to its service schedule. Transmission service generally includes replacing the transmission fluid, installing a new transmission pan gasket and if necessary installing a new transmission filter. If your car uses a timing belt that needs to be replaced it is imperative that you do not skip or delay this service. A snapped timing belt can wreak havoc on your engine, resulting in massive damage that will require expensive and extensive engine repair. 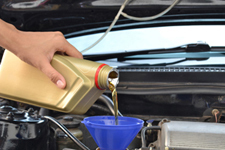 All cars and trucks use numerous types of fluids to operate their various systems. From time to time these fluids need to be drained and refilled to ensure that they are clear of any contaminants that could hinder their ability to do their job. This includes power steering fluid, coolant (cooling system fluid), and brake fluid. Auto maintenance is key to a long and healthy road life for your car. If it is time for auto maintenance in Palo Alto be sure to visit The Car Doctor. We offer dealership style service for all makes and models. To learn more about our services or to schedule expert auto maintenance in Palo Alto give us a call at (650) 492-6853 today.